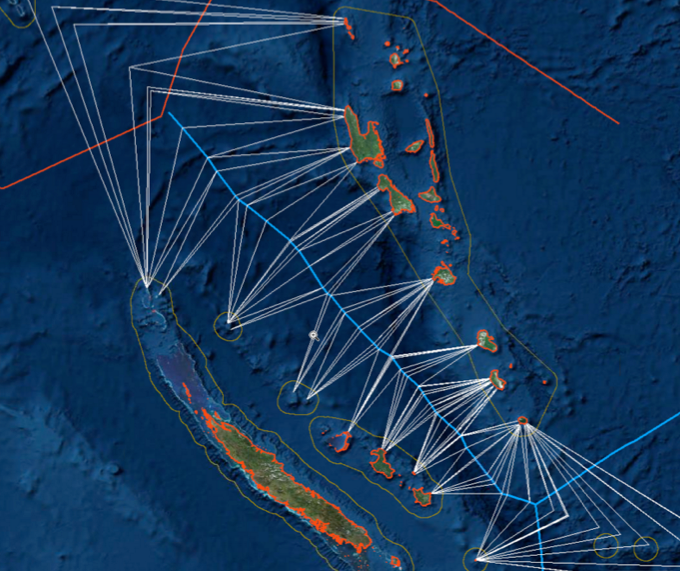 Maritime boundary claims are critically important for sovereign States, particularly when fossil fuel deposits, fishing grounds or other natural resources are involved. But what happens when two nearby States don’t have a defined maritime boundary? This is typically where the principle of provisional equidistance comes in. When it comes to land boundaries, there are often natural borders – like mountains and rivers – that help delineate States. Countries can also physically mark the land to indicate a limit. In the maritime world, though, there’s not much to go off of. Thus, provisional equidistance is critical. 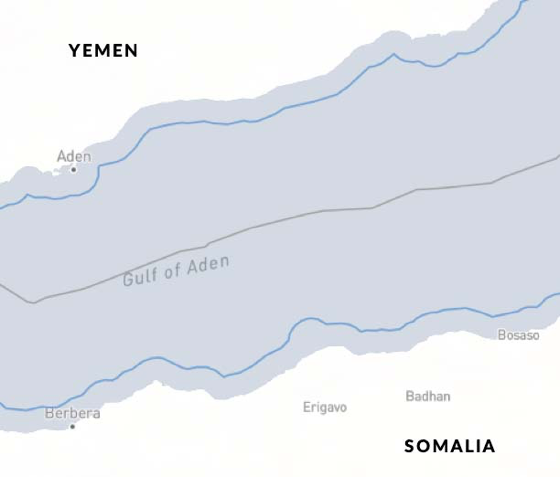 The grey line through the Gulf of Aden represents a provisional equidistance line between Yemen and Somalia. Countries that are adjacent to each other, however, have a line that extends out from the coast at an angle determined by the details of the baseline (coast). 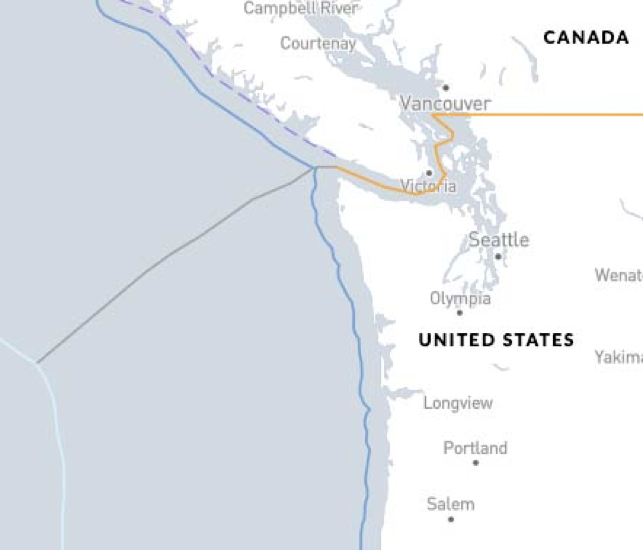 The grey line is a provisional equidistance line between Canada and the United States. It’s important to note that provisional equidistance lines are not official boundaries, as they lack a treaty or defining document behind them. Instead, they are drawn as a placeholder for a maritime boundary when one is not already agreed upon. In other words, provisional equidistance as it relates to maritime boundary claims is the concept that countries should conform to the median line that is of equal distance between the opposing or adjacent country. This idea of equally splitting up maritime space comes way before any legal document. Imagine this scenario: Country A starts fishing too close to the coast of Country B. Country B asks Country A to stop, kicking off the dialogue of “who owns what” and prompting them to figure out a boundary. Here lies the problem introduced before. There are no real markers on the surface of water to help delimit the boundary. Country B wants some sort of designation to avoid running into Country A during fishing ventures, but you can’t exactly build a fence in the ocean. That’s the line of provisional equidistance. Today, it’s far more complicated because we have highly accurate GPS and navigational tools, and other pieces of advanced technology that paint a more detailed picture of maritime space and respective sovereignty. It’s much easier now to “see” the distinct line between countries, which means more potential for disputes to crop up. But the concept of equidistance prevails. In fact, it’s rooted in the United Nations Convention on the Law of the Sea as a definitive concept to help guide countries in defining sovereignty where there are no agreements in place, and is therefore also a pillar in dispute resolution. In many cases, this starting point eventually translates into a real, court-backed boundary, or one agreed to bilaterally between coutries. Let’s take Ghana versus Cote d’Ivoire, for example. For over five decades, the neighboring countries respected an equidistance line between them in the Atlantic Ocean. Though this boundary was not recognized by a treaty, both countries accepted it, as demonstrated through oil agreements and other applications. However, Cote d’Ivoire’s position of acceptance changed in 2009 – following Ghana’s discovery of significant quantities of oil on its side of the boundary. Thus, five years of negotiations ensued as Cote d’Ivoire continued to propose different boundaries, all of which significantly cut into Ghana’s historically respected maritime space (based on equidistance) and threatened not only Ghana’s petroleum industry, but also the legal, political and economic stability of both countries. The dispute also introduced uncertainty into the law of maritime delimitation. It threatened to establish a new precedent of countries abandoning historical boundaries in favor of more expansive claims, motivated by the discovery of oil on the other side. In light of such implications, Ghana initiated proceedings with the International Tribunal for the Law of the Sea to set a real boundary that could be defined and enforced by the law – and in 2017, the two countries received a unanimous ruling that fixed the maritime boundary using a strict equidistance line … nearly identical to the one originally respected from 1960 to 2009. 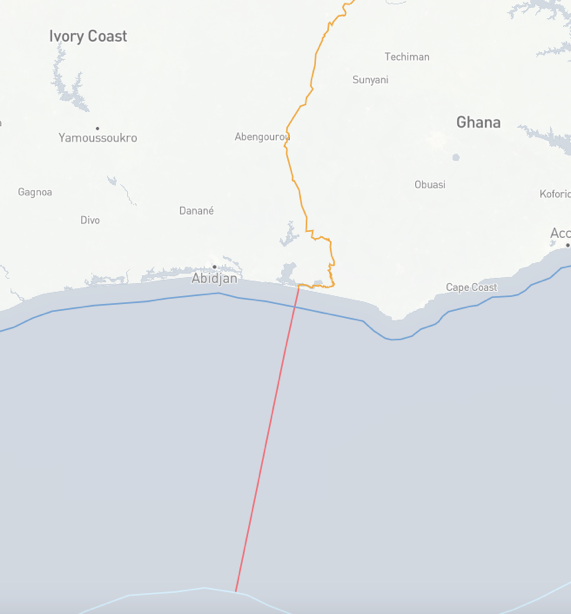 The red line is the court-ruled maritime boundary (based on equidistance) between Cote d’Ivoire and Ghana. In the Sovereign Limits database, we show “strict,” provisional equidistance in maritime spaces that lack an official boundary. No matter the coastline in question, the line is exactly in the middle without any alterations. This is to show the most neutral, wholistic visual of a country’s sovereign footprint. Though maritime boundaries, like that ruled on between Ghana and Cote d’Ivoire in 2017, are often based off of the median line, things start to change once they begin to formally construct a boundary. Highly technical observations generate various lines depending on the size of a territory and details on the coast. What happens to sovereignty if a country has a tiny rock island that disappears at high tide? What about when a flow of lava creates land right off the coast? Many questions arise and several factors on the coast come into play when constructing a maritime boundary, and various scenarios of equidistance are often constructed to illustrate how they might impact a boundary.. Though there is no formal agreement in place, this detailed provisional equidistance line we generated for Sovereign Limits provides a nice snap shot of what could be. As the image illustrates, provisional equidistance is much more than a line that cuts maritime space in half. It requires some research, accurate data and precise construction lines. This line stretches equally between the two territories based off of many key contributing points on each coastline. We’ve derived these baselines in two key ways: using data from the National Geospatial-Intelligence Agency (NGA) and using coastlines digitized directly from satellite images. The data is eventually processed in CARIS’s Limits and Boundaries module, to define the most accurate equidistance line possible based off of the baselines input. Our goal for Sovereign Limits is to show a comprehensive picture of sovereignty for each and every country. So, whenever a land boundary meets the sea, we draw a line of provisional equidistance to indicate what adjacent countries might be entitled to should they reach a boundary agreement, as well as what boundaries, in theory, they should respect in lack of an agreed maritime boundary. For another exercise in equidistance, check out my recent post on the Spanish enclaves in Morocco. What do countries respect in their daily operations? That’s a good question. Provisional equidistance is a great place to start. Interested in looking at other examples of provisional equidistance? Explore our international boundary database today.